Can We Be Green in Space? The survival of our species will someday require that we colonize other worlds. But can we get there without destroying our own in the process? 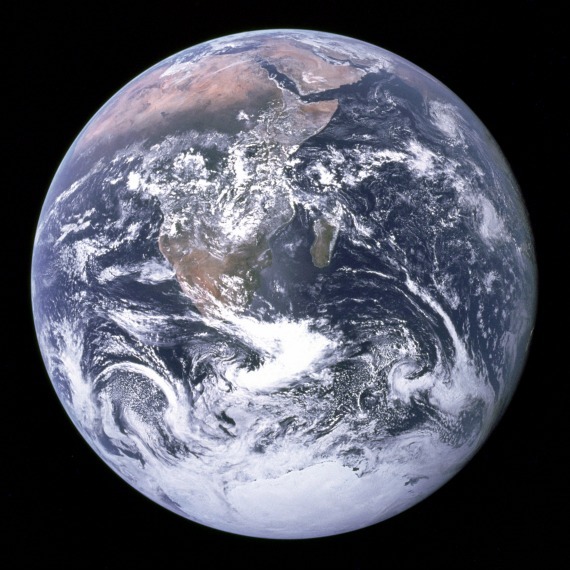 When astronauts sent back to Earth the iconic Blue Marble image in 1972, the picture galvanized the nascent environmental movement, demonstrating to the public how "tiny, vulnerable, and incredibly lonely" our planet is. Ironically, a society capable of taking that photo is also one that is capable of grave environmental damage. As engineer Laurent Pambaguian put it to me, we're "living at a time when life is comfortable and we have not destroyed the planet yet.” That time may not be long. Not your average, terrestrial environmentalist, Pambaguian is part of the European Space Agency’s Clean Space Initiative, which claims that “reaching for the sky leaves footprints on the ground.” It seeks to understand the environmental impact of space exploration, then find ways to reduce it. “Before, we didn’t take too much care. ‘There is plenty of room in space,’ we thought. Then we realized the room was very crowded,” says Pambaguian. NASA claims that more than 500,000 pieces of debris, ranging from the size of a marble to eight tons, are in orbit. These scattered fragments travel at speeds up to 17,500 mph. In the forthcoming movie Gravity, a piece of satellite debris destroys a shuttle, but even much smaller objects such as chips of paint could damage a satellite, space station, or a spacecraft carrying astronauts. Left uncollected, the debris stands to collide, creating clouds of fragments that would lead to an irreversible pollution problem. A 2009 study performed by all the major space agencies—including ESA, NASA, and Roscosmos—revealed that even if no further space launches occur, the amount of orbital debris will continue to increase. More than simply littering Earth’s low orbits, we would be hindering our ability to safely travel beyond it. The only way to preserve key orbits is to remove the debris, like picking up scraps of refuse blowing down a highway. Debris experts recommend removing at least five objects every year for the next 50 years. The approach shouldn’t leave debris behind as it cleans up the sky. This means developing a guidance and navigation control system where chasers stay close to the targeted debris. A capturing mechanism—a big net, a harpoon, a robotic arm, or a giant tentacle that, amid the stars, would clamp down on the object—would collect the debris and return it to Earth. The goal is to have a mission in 2022. Innocenti also emphasizes the need to design satellites that won’t become debris once they reach the end of their expected five-to-10 year life spans. Most satellites are equipped with collision avoidance maneuvers—until the last bead of propellant burns away and their uncontrolled orbits begin. The Clean Space Initiative is developing technology for satellites to return to the Earth’s atmosphere where they can safely burn down (called Design for Demise). “We produce very few spacecraft, so we believe our impact is very limited, but we also believe it is our moral obligation to make it better, whatever it is,” says Innocenti. The initiative is also developing new technology, such as non-toxic propellant, since the current fuel, hydrazine, is carcinogenic. Innocenti claims that being green does not mean being more expensive, it means streamlining with less energy and materials. NASA has also taken steps to minimize its impact on Earth and in space. The agency collaborates with the Department of Defense to characterize orbital debris. Their Sustainability Base, where emerging technologies are tested, is one of the greenest Federal buildings in the country. NASA claims it leaves virtually no carbon footprint. Engineers are also striving to prevent the cross-contamination of millions of microbes between Mars and Earth. But according to Pambaguian, a large obstacle stands in the way. “We always have an enemy that at the same time is a friend—heritage.” If a piece of technology works the way it’s supposed to, why shouldn’t it be used again? Qualifying new technology can take years and cost millions of dollars. That means relying on technology that was designed before the awareness of the environmental effects of spacecraft, launchers, and propellant emerged. And because space programs take years to develop, “state of the art” technology used to conceive a spacecraft can become obsolete the day it’s launched. “We have to convince people that this change of technology is opening up new possibilities and new opportunities,” says Pambaguian. Already, new legislative demands and regulations such as the European Commission’s regulation on the Registration, Evaluation and Authorization of Chemicals could threaten to impose limitations on materials that the space industry currently considers essential. By pioneering a more eco-friendly approach, space agencies can be on the frontier of not just space development, but human exploration. Every species has at one time explored in search of food and habitat for the sake of survival. And by the time an asteroid collides with Earth or the sun consumes our planet, leaving nothing but a white dwarf star some billions of years from now, the discoveries from our quests into space will be vital to avoiding our extinction. Sasha Ingber has written for National Geographic, The American Scholar, and The Washington Post Magazine.